This photo, taken by the UN in Syria and widely published by the media across the world, shows the residents of the Yarmouk Palestinian camp in Damascus rushing to receive food baskets distributed by the UN. The camp has been besieged by Syrian regime forces since July 2013. – Some 18,000 Palestinians and an unknown number of Syrians still live under siege in Yarmouk. They are bombed by regime forces on a daily basis, in addition to snipers surrounding the area. 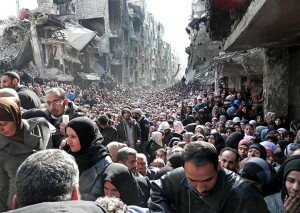 – More than 100,000 Palestinians lived in Yarmouk before the Syrian revolution started in March 2011. Most of them are now second-time refugees in other parts of Syria or in Jordan and Lebanon. – The camp has been completely destroyed. Almost every building has been hit by a shell or bomb. – The UN has distributed less then 10,000 food parcels in recent weeks. This is a “drop in the ocean”, as one UN official said. 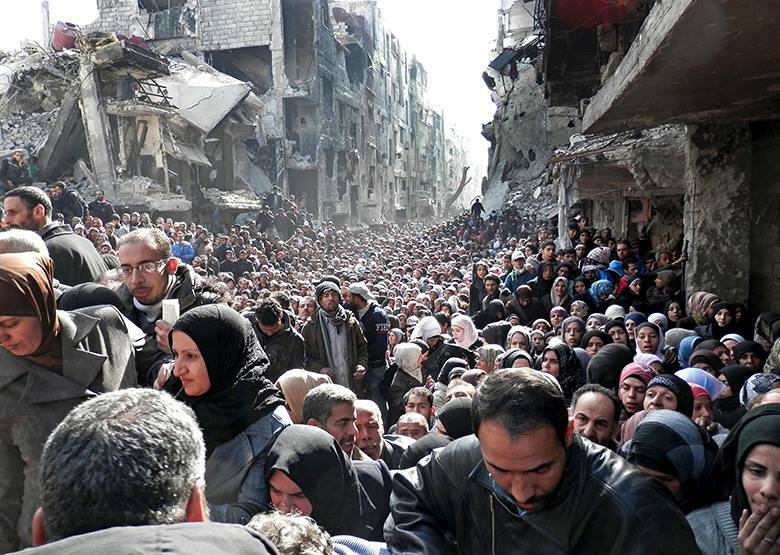 – The British newspaper The Guardian wrote the following about the photo: “It is a vision of unimaginable desolation: a crowd of men, women and children stretching as far as the eye can see into the war-devastated landscape of Yarmouk refugee camp in Damascus”. What Palestinian refugees are going through in Syria is a plain example of Iranian officials’ hypocrisy and lack of morals. While using the Palestinian conflict as an excuse to support Hezobllah in Lebonon and deploy Sepah Qods to the region, actual Palestinians are falling victim to the Islamic Republic’s political interests in Syria. In fact the very same forces that were supposedly established to defend Palestinians are helping the Assad regime shell and starve them. History can not forget this endless crowd of starving people, refugees who sought shelter but have instead been served explosive barrels and starved to death.